Coming off one of the New London, Connecticut corps’ best seasons in recent years, a sixth-place finish at the 2018 DCI Open Class World Championship Finals, 7th Regiment will look to further that success this summer. Leading the corps’ design team is program coordinator Jack Tully, who’s been a fixture of the Open Class corps for nearly a decade. According to Tully, the idea for “Poetic” has been in development for a number of years. Tully notes that as a “teaching drum corps,” one whose students might not come into the corps as experienced as some of their World Class counterparts, it’s always a priority to create something that will appeal first and foremost to those performers. 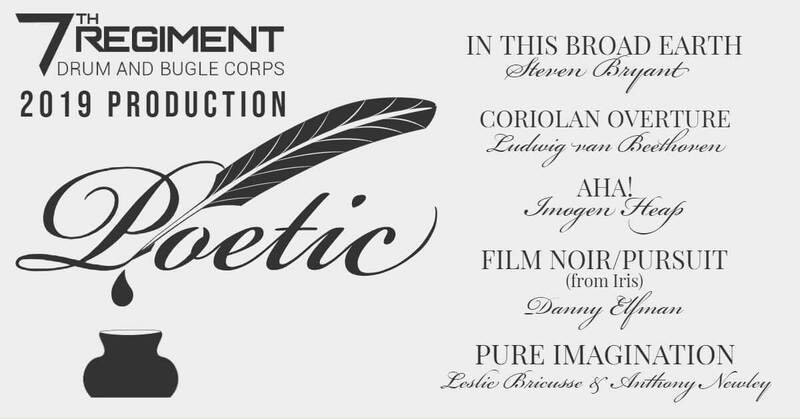 In creating “Poetic,” 7th Regiment’s design staff members will be tasked with finding a way to combine music with the written and spoken elements of poetry. To do this, they plan to start with the works of several well-known poets the likes of Walt Whitman and Edgar Allen Poe, and then fit the musical selections to those authors’ words. New uniforms as well as a stage set that may allow the corps to stage the front ensemble percussion section off the front sideline will also help give “Poetic” a memorable look. 7th Regiment has a number of rehearsal camps scheduled throughout the months of April and May. The corps plans to kick off its spring training on June 22 before making its 2019 competitive debut at the East Coast Classic on June 29 in Lawrence, Massachusetts.